in Mobile Marketing with tags Austin, Geo-specific targeting, Mr. Robot, pilot, sxsw, USA Network, Wi-Fi Both comments and trackbacks are closed. Using geo-specific targeting to ‘hack’ the mobile screens of Wi-Fi users traveling through the Austin–Bergstrom International Airport, we engaged each traveler in a full-screen ‘Mr. Robot’ content takeover. The activation aligned with the themes of the show – hacking and social disruption – and was intended to give participants the illusion that Mr. Robot himself was supplying them with their technological fix. USA Network further had all eyes and ears during a pilot episode premiere of the series at SXSW. The pilot, set to pique interest in the new series and promote USA’s presence at the conference, was followed by a Q&A session with creator, Sam Esmail, and stars Rami Malek, Christian Slater, Portia Doubleday and Carly Chaikin. The psychological drama follows an anti-social programmer by day – safeguard hacker by night – who finds himself at an intersection when he experiences a run-in with the mysterious leader of an underground hacking group. Plagued with the newly assigned task of taking down Corporate America which he believes is ruing the world – but which he is also supposed to protect – he must either adhere to his current employer or take on the irresistible job. ‘Mr. 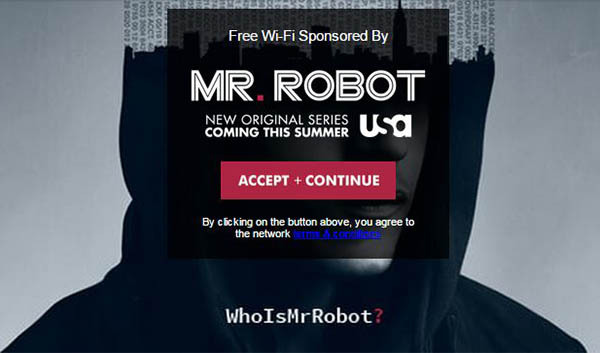 Robot’ premieres June 24 on USA Network. You can catch the new series Wednesdays at 10 p.m. EST.